On January 25th, Jerry Brown, governor of California, gave his last annual State of the State speech. It’s about looking forward to the future: tackling hard problems now. I wish more politicians were focused on this. The bolder path is still our way forward. Simply put, California is prospering. While it faces its share of difficulties, we should never forget the bounty and the endless opportunities bestowed on this special place—or the distance we’ve all traveled together these last few years. It is now hard to visualize—or even remember—the hardships, the bankruptcies and the home foreclosures so many experienced during the Great Recession. Unemployment was above 12 percent and 1.3 million Californians lost their jobs. Even today, you will find critics who claim that the California dream is dead. But I’m used to that. Back in my first term, a prestigious report told us that California had the worst business climate in America. In point of fact, personal income in 1975, my first year as governor, was $154 billion. Today it has grown to $2.4 trillion. In just the last eight years alone, California’s personal income has grown $845 billion and 2.8 million new jobs have been created. Very few places in the world can match that record. That is one of the reasons why confidence in the work that you are doing has risen so high. That contrasts sharply with the abysmal approval ratings given to the United States Congress. Certainly our on-time budgets are well received, thanks in large part to the lowering of the two-thirds vote to a simple majority to pass the budget. And by the way, you Republicans, as I look over here and I look over there, don’t worry, I’ve got your back! All these programs are big and very important to our future. And their passage demonstrates that some American governments can actually get things done—even in the face of deepening partisan division. The recent fires and mudslides show us how much we are affected by natural disasters and how we can rise to the occasion—at the local level, at the state level and with major help from the federal government. I want to especially thank all of the firefighters, first responders and volunteers. They answered the call to help their fellow neighbors, in some cases even when their own homes were burning. Here we see an example of people working together irrespective of party. The president himself has given California substantial assistance and the congressional leadership is now sponsoring legislation to help California, as well as the other states that have suffered major disasters—Texas, Florida and the Commonwealth of Puerto Rico. In this regard, we should never forget our dependency on the natural environment and the fundamental challenges it presents to the way we live. We can’t fight nature. We have to learn how to get along with her. And I want to say that again: We can’t fight nature. We have to learn how to get along with her. And that’s not so easy. For thousands of years this land now called California supported no more than 300,000 people. That’s 300,000 people and they did that for thousands and thousands—some people say, as long as 20,000 years. Today, 40 million people live in the same place and their sheer impact on the soils, the forests and the entire ecosystem has no long-term precedent. That’s why we have to innovate constantly and create all manner of shelter, machines and creative technologies. That will continue, but only with ever greater public and private investment. The devastating forest fires and the mudslides are a profound and growing challenge. Eight of the state’s most destructive fires have occurred in the last five years. Last year’s Thomas fire in Ventura and Santa Barbara counties was the largest in recorded history. The mudslides that followed were among the most lethal the state has ever encountered. In 2017, we had the highest average summer temperatures in recorded history. Over the last 40 years, California’s fire season has increased 78 days—and in some places it is nearly year-round. So we have to be ready with the necessary firefighting capability and communication systems to warn residents of impending danger. We also have to manage our forests—and soils—much more intelligently. Despite what is widely believed by some of the most powerful people in Washington, the science of climate change is not in doubt. The national academies of science of every major country in the world—including Russia and China—have all endorsed the mainstream view that human caused greenhouse gases are trapping heat in the oceans and in the atmosphere and that action must be taken to avert catastrophic changes in our weather systems. All nations agree except one and that is solely because of one man: our current president. • The nation’s only functioning cap-and-trade system. I will shortly provide an expenditure plan for the revenues that the cap-and-trade auctions have generated. Your renewing this program on a bipartisan basis was a major achievement and will ensure that we will have substantial sums to invest in communities all across the state—both urban and agricultural. The goal is to make our neighborhoods and farms healthier, our vehicles cleaner—zero emission the sooner the better—and all our technologies increasingly lowering their carbon output. To meet these ambitious goals, we will need five million zero-emission vehicles on the road by 2030. And we’re going to get there. Believe me. We only have 350,000 today, so we’ve all got a lot of work. And think of all the jobs and how much cleaner our air will be then. In addition, you passed—and more than two-thirds of voters approved—a water bond that invests in safe drinking water, conservation and storage. As a result, we will soon begin expending funds on some of the storage we’ve needed for decades. Finally, we have the California Waterfix, a long studied and carefully designed project to modernize our broken water system. I am convinced that it will conserve water, protect the fish and the habitat in the Delta and ensure the delivery of badly needed water to the millions of people who depend on California’s aqueducts. Local water districts—in both the North and South—are providing the leadership and the financing because they know it is vital for their communities, and for the whole state. That is true, and that is the reason why I have persisted. Our economy, the sixth largest in the world, depends on mobility, which only a modern and efficient transportation system provides. The vote on the gas tax was not easy but it was essential, given the vast network of roads and bridges on which California depends and the estimated $67 billion in deferred maintenance on our infrastructure. Tens of millions of cars and trucks travel over 330 billion miles a year. The sun’s only 93 million miles away. Government does what individuals can’t do, like build roads and bridges and support local bus and light rail systems. This is our common endeavor by which we pool our resources through the public sector and improve all of our lives. Fighting a gas tax may appear to be good politics, but it isn’t. I will do everything in my power to defeat any repeal effort that gets on the ballot. You can count on that. I’m looking for that one Republican. A brave, brave man. Since I have talked about tunnels and transportation, I will bring up one more item of infrastructure: high-speed rail. I make no bones about it. I like trains and I like high-speed trains even better. So did the voters in 2008 when they approved the bond. Look, 11 other countries have high-speed trains. They are now taken for granted all over Europe, in Japan and in China. President Reagan himself said in Japan on November 11, 1983 the following, and I quote: “The State of California is planning to build a rapid speed train that is adapted from your highly successful bullet train.” Yes, we were, and now we are actually building it. Takes a long time. Like any big project, there are obstacles. There were for the Bay Area Rapid Transit System, for the Golden Gate Bridge and the Panama Canal. I’ll pass over in silence the Bay bridge, that was almost 20 years. And by the way, it was over budget by $6 billion on a $1 billion project. So that happens. But not with the high-speed rail, we’ve got that covered. But build it they did and build it we will—America’s first high-speed rail system. One link between San Jose and San Francisco—an electrified Caltrain—is financed and ready to go. Another billion, with matching funds, will be invested in Los Angeles to improve Union Station as a major transportation hub and fix the Anaheim corridor. The next step is completing the Valley segment and getting an operating system connected to San Jose. Yes, it costs lots of money but it is still cheaper and more convenient than expanding airports, which nobody wants to, and building new freeways, which landowners often object to. All of that is to meet the growing demand. It will be fast, quiet and powered by renewable electricity and last for a hundred years. After all you guys are gone. Difficulties challenge us but they can’t discourage or stop us. Whether it’s roads or trains or dams or renewable energy installations or zero-emission cars, California is setting the pace for the entire nation. Yes, there are critics, there are lawsuits and there are countless obstacles. But California was built on dreams and perseverance and the bolder path is still our way forward. Taking action to further California’s climate leadership, Governor Edmund G. Brown Jr. today signed an executive order to boost the supply of zero-emission vehicles and charging and refueling stations in California. The Governor also detailed the new plan for investing $1.25 billion in cap-and-trade auction proceeds to reduce carbon pollution and improve public health and the environment. California is taking action to dramatically reduce carbon emissions from transportation—a sector that accounts for 50 percent of the state’s greenhouse gas emissions and 80 percent of smog-forming pollutants. To continue to meet California’s climate goals and clean air standards, California must go even further to accelerate the market for zero-emission vehicles. Today’s executive order implements the Governor’s call for a new target of 5 million ZEVs in California by 2030, announced in his State of the State address yesterday, and will help significantly expand vehicle charging infrastructure. The Administration is also proposing a new eight-year initiative to continue the state’s clean vehicle rebates and spur more infrastructure investments. This $2.5 billion initiative will help bring 250,000 vehicle charging stations and 200 hydrogen fueling stations to California by 2025. Today’s action builds on past efforts to boost zero-emission vehicles, including: legislation signed last year and in 2014 and 2013; adopting the 2016 Zero-Emission Vehicle Plan and the Advanced Clean Cars program; hosting a Zero-Emission Vehicle Summit; launching a multi-state ZEV Action Plan; co-founding the International ZEV Alliance; and issuing Executive Order B-16-12 in 2012 to help bring 1.5 million zero-emission vehicles to California by 2025. In addition to today’s executive order, the Governor also released the 2018 plan for California’s Climate Investments—a statewide initiative that puts billions of cap-and-trade dollars to work reducing greenhouse gas emissions, strengthening the economy and improving public health and the environment–particularly in disadvantaged communities. California Climate Investments projects include affordable housing, renewable energy, public transportation, zero-emission vehicles, environmental restoration, more sustainable agriculture and recycling, among other projects. At least 35 percent of these investments are made in disadvantaged and low-income communities. The $1.25 billion climate investment plan can be found here. • Richard Martin, The one and only Texas wind boom, Technology Review, 3 October 2016. It has also shown that a big state can get a substantial amount of its power from renewable sources without significant disruptions, given the right policies and the right infrastructure investments. The U.S. Department of Energy’s 2015 report Wind Vision set a goal of getting 35 percent of all electricity in the country from wind in 2050, up from 4.5 percent today. In Texas, at times, that number has already been exceeded: on several windy days last winter, wind power briefly supplied more than 40 percent of the state’s electricity. For wind power advocates, Texas is a model for the rest of the country. • Ed Crooks, Balance of power tilts from fossil fuels to renewable energy, Financial Times, 26 July 2016. The Dubai Electricity and Water Authority said in May it had received bids to develop solar power projects that would deliver electricity costing less than three cents per kilowatt hour. This established a new worldwide low for the contracted cost of delivering solar power to the grid—and is priced well below the benchmark of what the emirate and other countries typically pay for electricity from coal-fired stations. 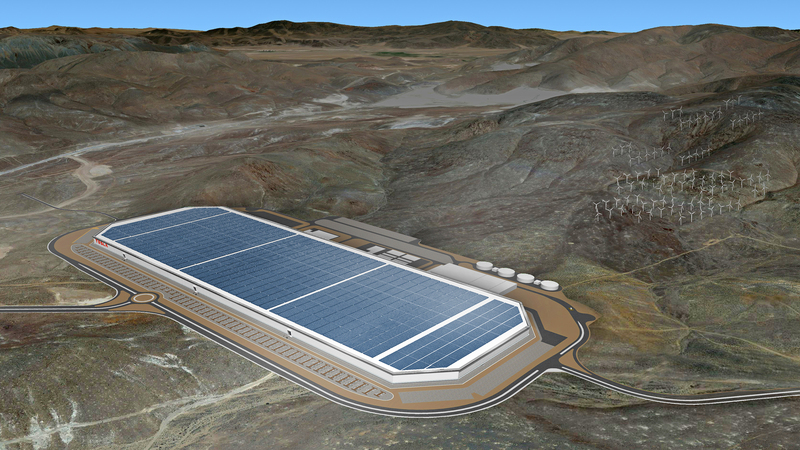 I’m also interested in Elon Musk’s Gigafactory: a lithium-ion battery factory in Nevada with a projected capacity of 50 gigawatt-hours/year of battery packs in 2018, ultimately ramping up to 150 GWh/yr. These battery packs are mainly designed for Musk’s electric car company, Tesla. • Matthew Debord, Tesla has to overcome a major problem for its massive new Gigafactory to succeed, Singapore Business Insider, 1 August 2016. Basically, it’s hard to make cars as efficiently as traditional auto companies have learned to do, and as long as people don’t buy many electric cars, it’s hard to get better quickly. One of the big problems with intermittent power sources like wind and solar is the difficulty of storing energy. But if we ever get a lot of electric vehicles, we’ll have a lot of batteries—and at any time, most of these vehicles are parked. So, they can be connected to the power grid. This leads to the concept of vehicle-to-grid or V2G. In a V2G system, electric vehicles can connect to the grid, with electricity flowing from the grid to the vehicle or back. Cars can help solve the energy storage problem. At the University of Delaware, dozens of electric vehicles sit in a uniform row. They’re part of an experiment involving BMW, power-generating company NRG, and PJM—a regional organization that moves electricity around 13 states and the District of Columbia—that’s examining how electric vehicles can give energy back to the electricity grid. It works like this: When the cars are idle (our vehicles typically sit 95 percent of the time), they’re plugged in and able to deliver the electricity in their batteries back to the grid. When energy demand is high, they return electricity to the grid; when demand is low, they absorb electricity. One car doesn’t offer much, but 30 of them is another story—worth about 300 kilowatts of power. Utilities will pay for this service, called “load leveling,” because it means that they don’t have to turn on backup power plants, which are usually coal or natural gas burners. And the EV owners get regular checks—approximately $2.50 a day, or about $900 a year. V2G still has some technical hurdles to overcome, but carmakers—and utilities, too—want it to happen. In a 2014 report, Edison Electric Institute, the power industry’s main trade group, called on utilities to promote EVs [electric vehicles], describing EV adoption as a “quadruple win” that would sustain electricity demand, improve customer relations, support environmental goals, and reduce utilities’ operating costs. Utilities appear to be listening. In Virginia and North Carolina, Dominion Resources is running a pilot project to identify ways to encourage EV drivers to only charge during off-peak demand. In California, San Diego Gas & Electric will be spending $45 million on a vehicle-to-grid integration system. At least 25 utilities in 14 states are offering customers some kind of EV incentive. And it’s not just utilities—the Department of Defense is conducting V2G pilot programs at four military bases. I wonder how much, exactly, this system would help. • Jim Motavalli, Siri, will connected vehicles be greener?, Sierra, May–June 2016. 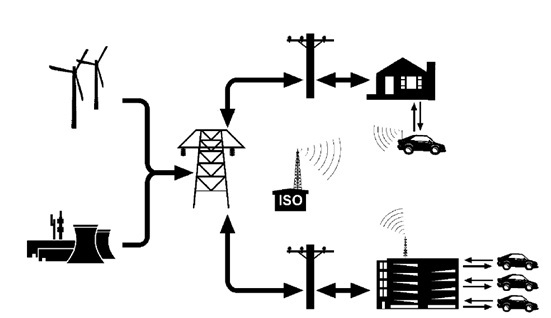 Motavalli also discusses vehicle-to-vehicle connectivity and vehicle-to-building systems. The latter could let your vehicle power your house during a blackout—which seems of limited use to me, but maybe I don’t get the point. In general, it seems good to have everything I own have the ability to talk to all the rest. There will be security concerns. But as we move toward ‘ecotechnology’, our gadgets should become less obtrusive, less hungry for raw power, more communicative, and more intelligent. The video here is quite gripping: you should watch it! So the answer to the first question, “Must we change?” is yes, we have to change. Second question, “Can we change?” This is the exciting news! The best projections in the world 16 years ago were that by 2010, the world would be able to install 30 gigawatts of wind capacity. We beat that mark by 14 and a half times over. We see an exponential curve for wind installations now. We see the cost coming down dramatically. 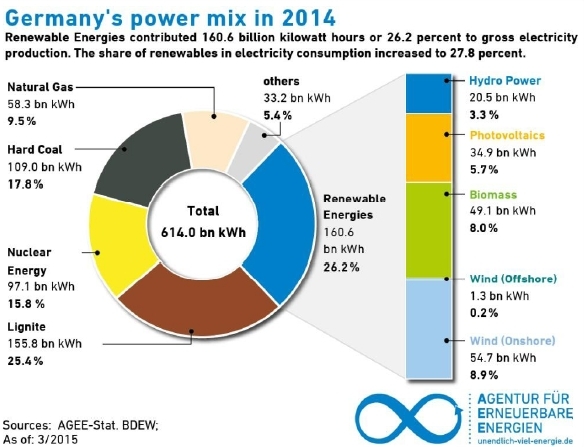 Some countries—take Germany, an industrial powerhouse with a climate not that different from Vancouver’s, by the way—one day last December, got 81 percent of all its energy from renewable resources, mainly solar and wind. A lot of countries are getting more than half on an average basis. More good news: energy storage, from batteries particularly, is now beginning to take off because the cost has been coming down very dramatically to solve the intermittency problem. With solar, the news is even more exciting! The best projections 14 years ago were that we would install one gigawatt per year by 2010. When 2010 came around, we beat that mark by 17 times over. Last year, we beat it by 58 times over. This year, we’re on track to beat it 68 times over. We’re going to win this. We are going to prevail. The exponential curve on solar is even steeper and more dramatic. When I came to this stage 10 years ago, this is where it was. We have seen a revolutionary breakthrough in the emergence of these exponential curves. And the cost has come down 10 percent per year for 30 years. And it’s continuing to come down. Now, the business community has certainly noticed this, because it’s crossing the grid parity point. Cheaper solar penetration rates are beginning to rise. Grid parity is understood as that line, that threshold, below which renewable electricity is cheaper than electricity from burning fossil fuels. That threshold is a little bit like the difference between 32 degrees Fahrenheit and 33 degrees Fahrenheit, or zero and one Celsius. It’s a difference of more than one degree, it’s the difference between ice and water. And it’s the difference between markets that are frozen up, and liquid flows of capital into new opportunities for investment. This is the biggest new business opportunity in the history of the world, and two-thirds of it is in the private sector. We are seeing an explosion of new investment. Starting in 2010, investments globally in renewable electricity generation surpassed fossils. The gap has been growing ever since. The projections for the future are even more dramatic, even though fossil energy is now still subsidized at a rate 40 times larger than renewables. And by the way, if you add the projections for nuclear on here, particularly if you assume that the work many are doing to try to break through to safer and more acceptable, more affordable forms of nuclear, this could change even more dramatically. So is there any precedent for such a rapid adoption of a new technology? Well, there are many, but let’s look at cell phones. In 1980, AT&T, then Ma Bell, commissioned McKinsey to do a global market survey of those clunky new mobile phones that appeared then. “How many can we sell by the year 2000?” they asked. McKinsey came back and said, “900,000.” And sure enough, when the year 2000 arrived, they did sell 900,000—in the first three days. And for the balance of the year, they sold 120 times more. And now there are more cell connections than there are people in the world. • John Baez, The EU’s biggest renewable eneergy source, 18 September 2013. According to this map based on reports put out by Deutsche Bank (here and here), the green countries reached grid parity before 2014. The blue countries reached it after 2014. The olive countries have reached it only for peak grid prices. The orange regions are US states that were ‘poised to reach grid parity’ in 2015. But of course there are other issues: the intermittency of solar power, the difficulties of storing energy, etc. How optimistic should we be? • Ken Caldeira, Stop Emissions!, Technology Review, January/February 2016, 41–43. Near the end, he writes “despite all these reasons for despair, I’m hopeful”. He is hopeful that a collective change of heart is underway that will enable humanity to solve this problem. But he doesn’t claim to know any workable solution to the problem. In fact, he mostly list reasons why various possible solutions won’t be enough.